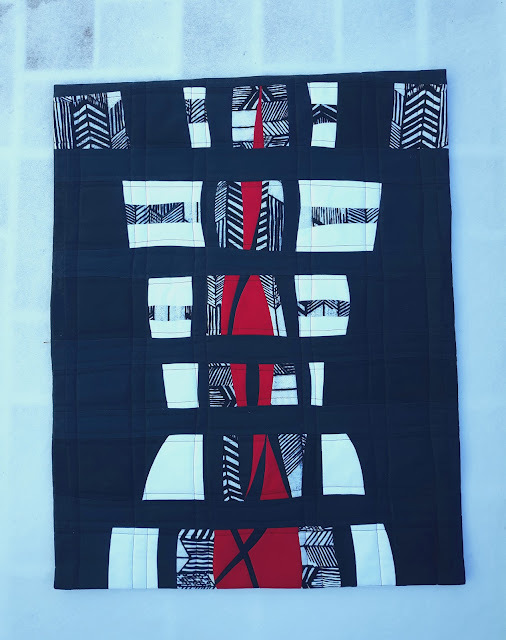 One week challenge for Project Quilting hosted by Kim at Project Quilting Season 10. 4 which Trisha (quiltchicken) came up with Pixel Play. 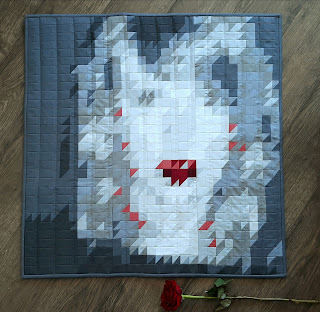 If you know me you know I love a good pixel quilt. I am intentionally leaving my photos small because for this pixel piece it is best to see it from as far away as possible......really even if you squint you can see how much more of a photograph this looks like. Try it!!! Thumb nail size is best. I did the block sections at the time of the qal and managed a little change in the arrangement. 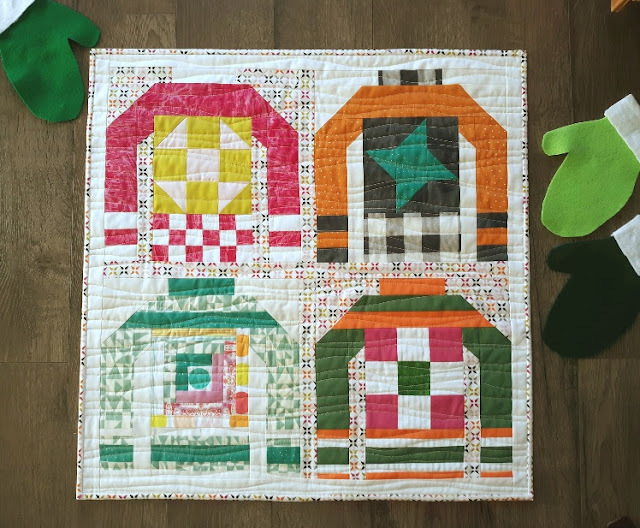 It was a super fun quilt to make. But then how to quilt it? I felt it is such a whimsical quilt so thought I would go outside my comfort zone and have someone else quilt it. 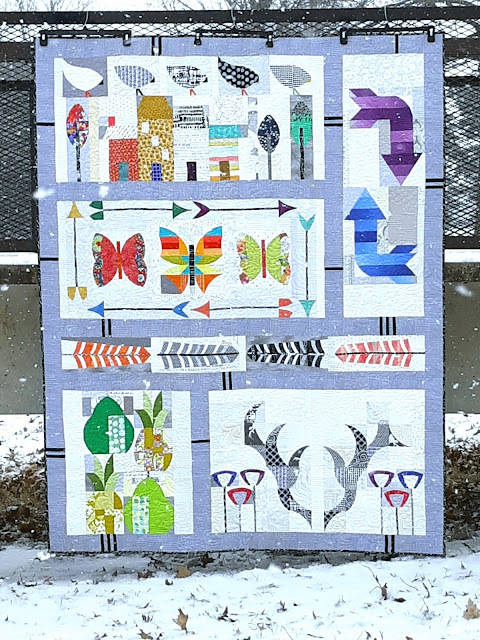 A friend in my lcq works for Mangelsons and they do quilting so she quilted it for me in a fun mash up of designs called 'texture'. I brought it home and squared it up and bound it the next day. Whoop there it is.....one off my UFO pile!!! It was 13 degrees out and snowing but I went out for a quick photo shoot and came home with these beauties to share. 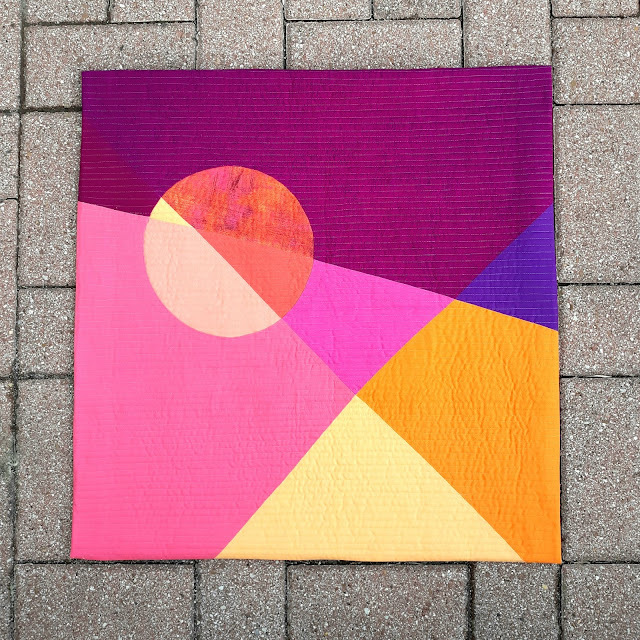 So fun to put this naturey quilt out in the wild. 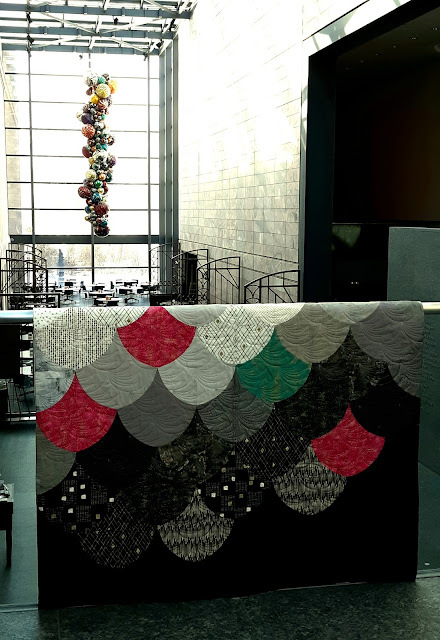 Here you can see the quilting that Haley did!. It is all texturey goodness. 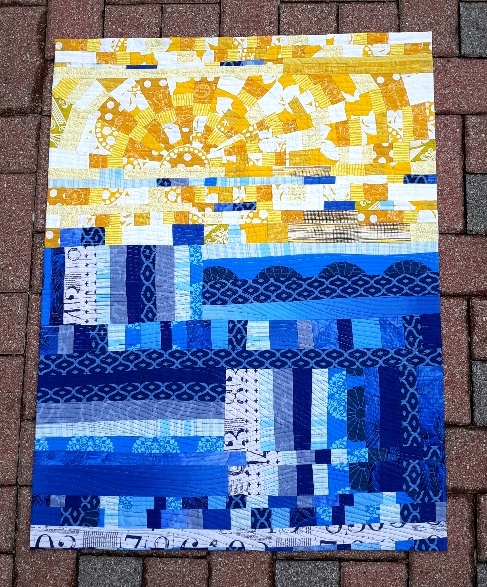 Love the Quick Curve Ruler gals for fun innovative quilts. 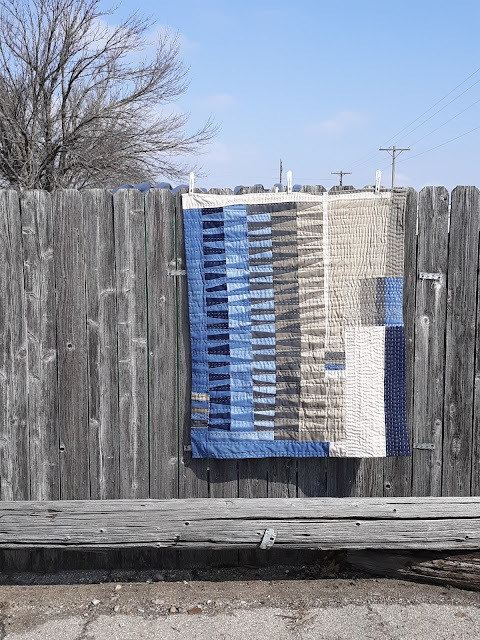 "Path Interrupted" is my Project Quilting 10.2 for the red, white and blue theme. 20" x 27" improv pieced improv walking foot quilting in a woven pattern of organic lines made in Ne. I have to admit that red, white and blue are not my favorite combination of colors. I thought about just using 2 colors but I could not think of what I wanted to make for this challenge. In the mean time I was getting the email updates from Amy's creative Side on getting started with Improv. I adore improv and while I have not been joining in on the daily challenges I have been following along. I finally thought to get myself unstuck on the PQ challenge that I would cut some strips of red, white and blue pieces and put some strip sets together. I did not have a resolution this year but in my head I want to use a lot of what I have and dig out my patterns and books and just have fun making stuff. Well when the challenge came last Sunday I thought that the Hula Girl pattern by Sharon over @Color girl Quilts fit the bill. 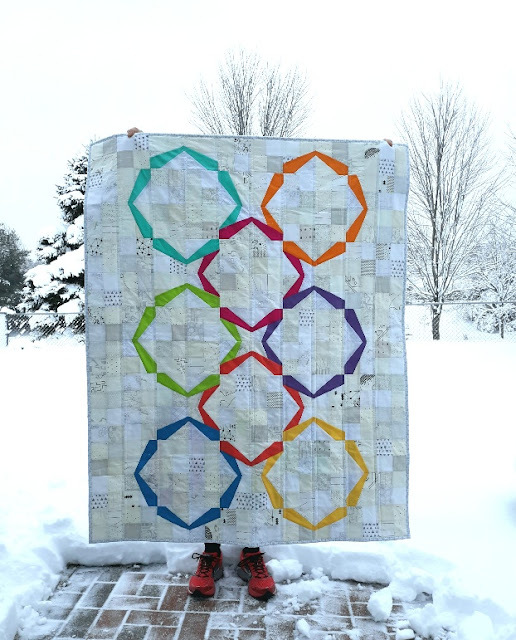 I love the linking rings in this quilt. Well, truthfully I had a bit of trouble paper piecing them to size from my printer but now I love them. haha The rings link in a way that allows everyone one to fit together, be together, side by side. Various low volume prints and solids in the back ground make the rings pop. Like the Olympic rings, I feel it represents everyone from everywhere coming together. I think that is hopeful. Sadly this is horrible pick but you can see the fun tree skirt top and the 4 way tie winners of the ugly contest. and lastly..... Went to visit my sister for Christmas. Got there just in time to help with a marshmallow snowman project my great niece was working on.